The public availability of the Microsoft Edge Chromium browser for testing marks a significant milestone for the company as they work to reverse the non-acceptance of the company's Windows 10 web browser. Microsoft Edge made its debut as part of Windows 10 back in July 2015 and even then, it was facing an uphill battle when it came to market share and user adoption from enterprise and business customers. Google's Chrome was and has been the defacto standard for most of these companies with Internet Explorer and FireFox following along from a very distant 2nd and 3rd place according to NetMarketShare. At the time, Microsoft's goal with Edge was to provide an experience that was tightly integrated with Windows 10. However, that relationship was tied too closely to the operating system because Edge was not available outside Windows 10. In addition, feature improvements and other enhancements were shipped just twice per year and were directly tied to the feature update cycle of Windows 10. The Microsoft Edge Chromium browser, which released in preview today, intends to reverse those trends by offering an updated version of the browser that uses Chromium at its core instead of Microsoft's own EdgeHTML rendering engine. It will eventually be available for Windows 7, 8, 8.1 and MacOS. For right now a developer and canary preview is available on x64 versions of Windows 10. The Microsoft Edge Chromium web browser will also be available in the future as a beta and stable build before the end of 2019, but the time is now for enterprise and business customers to begin their own internal testing for app compatibility and other functionality. Since the announcement of the company's move to Chromium back in December, they have been working to reach the first release stage in order to make the Microsoft Edge Chromium browser publicly available. Now, continued development will be fully in the public eye but there are a few caveats since this is a pre-release product. Microsoft Edge Chromium is not feature-complete so if users depend upon a capability in the production release of Edge on Windows 10 then they will need to keep using that browser for the foreseeable future. The good news is that both the dev and canary branches of Edge Chromium can be installed right alongside Edge, Chrome, and FireFox. 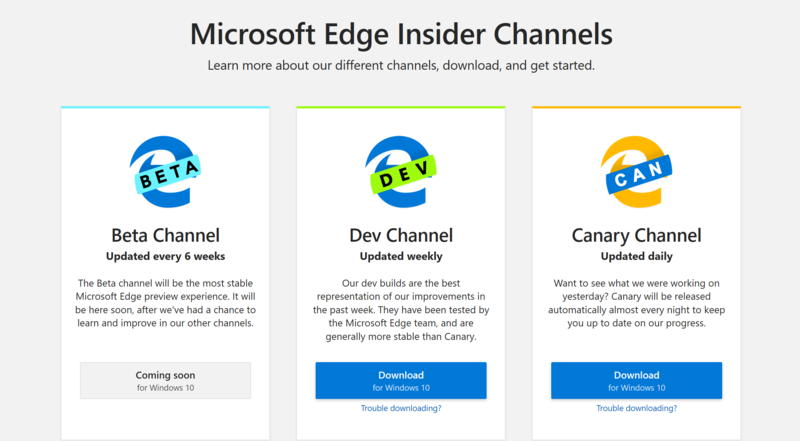 Canary builds will be updated nightly, and developer builds will get a weekly update. Although Microsoft has curated a web-based extensions store for Edge Chromium, users can also use extensions from the Chrome Web Store. When they browse to the Chrome Web Store, they will be prompted to allow extensions from other stores. Edge extensions in the Microsoft Store on Windows 10 will only install on the production release of Edge that is part of Windows 10. The sync experience on these early builds is not yet complete. Data can only be synched by using a Microsoft Account. Work and school accounts will become available later. Just your Favorites will sync between devices running Microsoft Edge Chromium builds. Browsing data, passwords, and form data will come later. Spellcheck is not available nor can you cast from Microsoft Edge Chromium to an external device. Popular Edge features like ink support and the ability to set aside tabs will follow along with other popular Edge specific capabilities. At these early stages, the Microsoft Edge Chromium browser is not intended to become an enterprise's preferred web browser tomorrow. Microsoft's goal is to get users putting the new version of Edge through its paces by trying it within the corporate boundaries of their own line of business apps and other services. For the most part, if those sites are compatible with Google Chrome, then they should work with the Microsoft Edge Chromium browser.